Whilst in Ikea a few months ago I spotted these acrylic storage boxes, they actually come in a set of five and also include a large square box and a rectangle one too which I use to store tealight candles in. 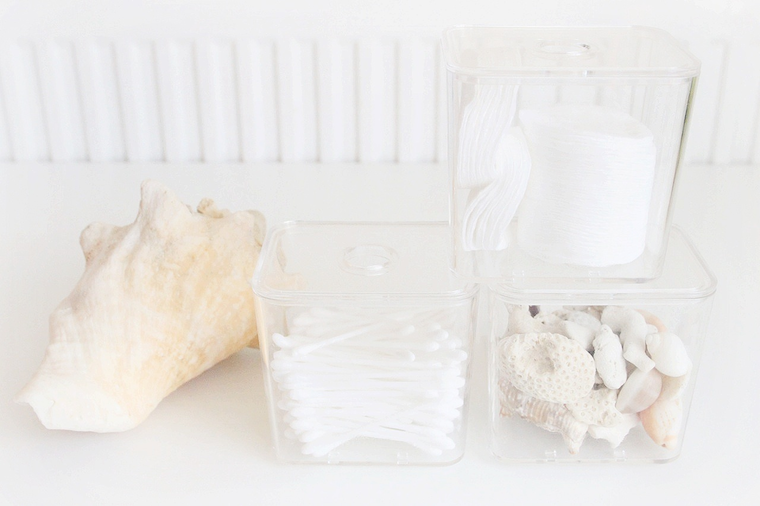 With these smaller boxes I store some of my favourite seashells in one and less pretty cotton pads and buds in the other two, I have them all placed on the rågrund shelving unit in my bathroom which works really well. That large rather strange looking shell is one that I picked off a beach in the caribbean which also takes pride of place too, you can't beat having lots of shells in a bathroom! You can also pop the storage boxes into drawers to keep hair accessories and make up in too, definitely check them out as you never know what they could come in handy for.